A suit of restored Han dynasty period iron lamellar armour, unearthed in Hohhot. Chinese armour was predominantly lamellar from the Warring States period (481 BC - 221 BC) onward, prior to which animal parts such as rhinoceros hide, leather, and turtle shells were used for protection. Lamellar armour was supplemented by scale armour starting from the Han dynasty (206 BC–220 AD) forward, partial plate armour from the Northern and Southern dynasties (420–589), and mail and mountain pattern armour from the Tang dynasty (618–907). During the Ming dynasty (1368–1644), brigandine began to supplant lamellar armour and was used to a great degree into the Qing dynasty (1644–1912.). By the 19th century most Qing armour, which was of the brigandine type, were purely ceremonial, having kept the outer studs for aesthetic purposes, and omitted the protective metal plates. The earliest archaeological evidence of armour in China dates to the Shang dynasty. These were either breastplates made of shell tied together or a one-piece leather breastplate. Helmets were made of bronze and often sported elaborate designs consisting of animal motifs. Armour was exclusively for nobles; regular folks had no protection except for a leather covered bamboo shield. Armour in the Zhou dynasty consisted of either a sleeveless coat of rhinoceros or buffalo hide, or leather scale armour. Helmets were largely similar to Shang predecessors but less ornate. Chariot horses were sometimes protected by tiger skins. Ordain that serious crimes are to be redeemed with a suit of rhinoceros armour and one halberd, and minor crimes with a plaited leather shield and one halberd. Misdemeanours are to be punished with [a fine of] a quota of metal [jin fen 金分], and doubtful cases are to be pardoned. A case should be delayed for investigation for three [days] without allowing arguments or judgements; [by the time] the case is judged [the subject will have produced] one bundle of arrows. Good metal [mei jin 美金] should be cast into swords and halberd[-heads] and tested on dogs and horses, while poorer metal [e jin 惡金] should be cast into agricultural implements and tested on earth. Lamellar armour of leather, bronze and iron appeared by the mid-4th century BC. Lamellar consisted of individual armour pieces that were either riveted or laced together to form a suit of armour. Iron helmets constructed with multiple pieces of iron lamellae began to replace the one piece bronze helmets of old. One sample discovered in Yi county, Hebei Province was composed of 89 lamellae. The average dimensions of the lamellae pieces were 5cm x 4cm. In the 3rd century BC, both iron weapons and armour became more common. According to the Xunzi, "the hard iron spears of Wan (宛) [a city in Chu, near modern Nanyang (南陽), Henan] are as cruel as wasps and scorpions." Iron weapons also gave Chinese armies an edge over barbarians. Han Fei recounts that during a battle with the Gonggong (共工) tribe, "the iron-tipped lances reached the enemy, and those without strong helmets and armour were injured." The effectiveness of bronze axes and shields may have been superseded by new iron weaponry and armor. The efficiency of crossbows however outpaced any progress in defensive armour. It was considered a common occurrence in ancient China for commoners or peasants to kill a lord with a well aimed crossbow bolt, regardless of whatever armour he might have been wearing at the time. Shun taught the ways of good government for the following three years, and then took up shield and battle-ax and performed the war dance, and the Miao submitted. But in the war with the Gonggong, men used iron lances with steel heads that reached to the enemy, so that unless one was protected by a stout helmet and armor he was likely to be wounded. Hence shields and battle-axes served for ancient times, but no longer serve today. So I say that as circumstances change the ways of dealing with them alter too. Armour was mostly restricted to elite guard units and each state distributed armour in their own ways. The state of Chu favorited elite armoured crossbow units known for their endurance, and were capable of marching 160km 'without resting.' 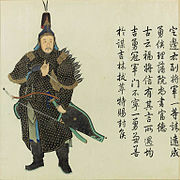 Wei's elite forces were capable of marching over 40km in one day while wearing heavy armour, a large crossbow with 50 bolts, a helmet, a side sword, and three days worth of rations. Those who met these standards earned an exemption from corvée labor and taxes for their entire family. According to Su Qin, the state of Han made the best weapons, capable of cleaving through the strongest armour, shields, leather boots and helmets. Their soldiers wore iron facemasks. By the end of the 3rd century BC at least a few horsemen wore armour of some kind. The Qin calculated fines for more severe crimes in terms of one or two coats of armour, lower crimes in terms of shields, and the lowest in terms of coins. Qin soldiers sometimes threw off their armour in a kind of berserk rage and engaged in fanatical charges. Qin armour usually used rectangular lamellae pieces with dimensions of 7.5cm x 8.5cm and 10.5cm x 7.8cm. Dimensions of lamellae used for charioteer armour varies between the upper body, lower body, and arms. Lamellae on the upper body were 7cm x 6cm, the lower body 9cm x 6.5cm, and arms 4-7.5cm x 4cm. Lamellae pieces on cavalrymen were 8cm x 5.7cm. A complete set of Qin armour, judging by the finds in the Terracotta Army consisted of 250 to 612 lamellae pieces in total, not including the helmet. Six groups of armour have been identified in the Terracotta Army corresponding to rank and military division. Ordinary soldiers are outfitted with no armour at all, cavalrymen with armour that covered the chest, armed infantry with armour covering the torso and shoulders, low-ranking officers with armour using large lamellae pieces, middle-ranking officers with shorter armour covering the torso and waist or just the breast, but with decorations such as ribbons, and generals with a distinctive coat showing torso armour and ribbons to signify their status. 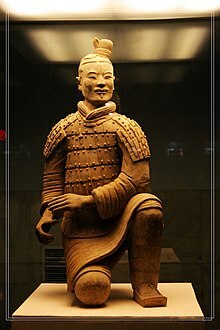 None of the terracotta soldiers have been found wearing a helmet or holding a shield. The generals wear a pheasant-tail headdress while middle ranking officers wear a long flat cap. Both armed infantry and cavalrymen have soft caps, but while the infantry cap accommodates the top knot, the cap for cavalyrmen is flat and tied below the chin. 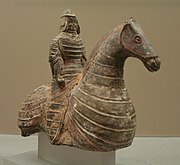 There is some evidence that armour for horses might have existed for Qin cavalry judging by 300 lamellae pieces too large for human use, but they are too damaged by fires to be reconstructed. Han dynasty armour was largely the same as the Qin dynasty with minor variations. Infantry wore suits of lacquered rawhide, hardened and lacquered leather [or rawhide? ], or iron lamellar armour and caps or iron helmets. A suit of iron armour dating to the Western Han period consisted of 328 lamellae pieces. Some riders wore armour and carried shields but substantial horse armour is not attested to until the late 2nd century. During the late 2nd century BC, the government created a monopoly on the ironworks, which may have caused a decrease in quality of iron and armour. Bu Shi claimed that the resulting products were inferior because they were made to meet quotas rather than for practical use. These monopolies as debated in the Discourses on Salt and Iron were abolished by the beginning of the 1st century AD. In 150 AD, Cui Shi made similar complaints about the issue of quality control in government production due to corruption: "...not long thereafter the overseers stopped being attentive, and the wrong men have been promoted by Imperial decree. Greedy officers fight over the materials, and shifty craftsmen cheat them... Iron [i.e. steel] is quenched in vinegar, making it brittle and easy to... [?] The suits of armour are too small and do not fit properly." Composite bows were considered effective against unarmoured enemies at 165 yards, and against armoured opponents at 65 yards. By the Three Kingdoms period many cavalrymen wore armour and some horses were equipped with their own armour as well. In one battle, the warlord Cao Cao boasted that with only ten sets of horse armour he had faced an enemy with three hundred sets. The horse armour may however have just been partial frontal barding. References to "great shields" occur in their usage on the front line to protect spearmen and crossbowmen. Shields were also commonly paired with the single edged dao and used among cavalrymen. Descriptions of the Battle of Guandu mention that Cao Cao's soldiers employed shield cover above their heads each time they moved out into the open due to oppressive arrow fire from Yuan Shao's wooden towers. A report in 231 AD mentions the capture of 5,000 suits of "dark armour" (xuan kai or xuan jia 玄鎧/玄甲) and 3,100 crossbows. Dark armour appears in Han texts as well, but only as the attire worn by honor guards at funeral processions. The only trait known about dark armour is that it reflected the sun's rays. This probably means dark armour was made of high quality steel, which was often associated with black ferrous material. The Previous Emperor presented your vassal with armor (kai), to wit, a suit of "black-brilliant" (heiguang) and one of "bright-brilliant" (mingguang) and a suit of "double-faced" (liangtang) armor, but now that the present age is peaceful and the weapons and armor (bingge) are not of use, I request leave to turn them all over to the Armor Board (kaicao) to be taken care of. Gleams and shines, throwing off light. Cataphract-like horse armour appeared in northeastern China in the mid 4th century during the Eastern Jin dynasty, probably as a result of Xianbei influence. 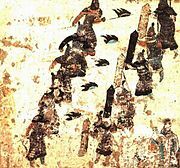 By the end of the 4th century murals depicting horse armour covering the entire body were found in tombs as far as Yunnan. Sources mention the capture of thousands of "armored horses" in a single battle. Shi Hu's bodyguard was said to have worn "fine five-colored armour" (wuse xikai), which was so dazzling it blinded the eye. This was probably similar in construction to brilliant armour. During the Northern and Southern dynasties period (420-589), a style of armour called "cord and plaque" became popular, as did shields and long swords. "Cord and plaque" armour consisted of double breast plates in the front and back held together, sometimes on a frame, by two shoulder straps and waist cords, worn over the usual lamellar armour. "Cord and plaque" wearing figurines are also often depicted holding an oval or rectangular shield and a long sword. Types of armour had also apparently become distinct enough for there to be separate categories for light and heavy armour. Bright brilliant armour continued to be prominent. In 518 AD, the Northern Wei court gave a visiting Avar chieftain a set of fine bright brilliant cavalry armour and six sets of iron cavalry armour. Deployment of armoured cavalry was common for the Northern Wei, especially among the "iron-clad" Erzhu tribe who specialized in armoured cavalry. References to heavy cavalry as "iron horses" occur in the poetry of Lu Chui. In 543 AD, the Western Wei general Cai Yu came to be known as "iron tiger" for his distinctive bright brilliant armour. In the 6th century, Qimu Huaiwen introduced to Northern Qi the process of 'co-fusion' steelmaking, which used metals of different carbon contents to create steel. Apparently sabers made using this method were capable of penetrating 30 armour lamellae. It's not clear if the armour was of iron or leather. Huaiwen made sabres [dao 刀] of 'overnight iron' [su tie 宿鐵]. His method was to anneal [shao 燒] powdered cast iron [sheng tie jing 生鐵精] with layers of soft [iron] blanks [ding 鋌, presumably thin plates]. After several days the result is steel [gang 剛]. Soft iron was used for the spine of the sabre, He washed it in the urine of the Five Sacrificial Animals and quench-hardened it in the fat of the Five Sacrificial Animals: [Such a sabre] could penetrate thirty armour lamellae [zha 札]. The 'overnight soft blanks' [Su rou ting 宿柔鋌] cast today [in the Sui period?] by the metallurgists of Xiangguo (襄國) represent a vestige of [Qiwu Huaiwen's] technique. The sabres which they make are still extremely sharp, but they cannot penetrate thirty lamellae. Northern Wei heavy cavalry funerary figurine. Cavalry of the Southern dynasties. 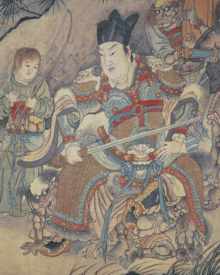 The Sui dynasty made prodigious use of heavy cavalry. Both men and horses were heavily armoured. The History of Sui provides an account of the "first cavalry battalions" of the dynasty's 24 armies. They wore "bright-brilliant" (mingguang) armour made of decarburized steel connected by dark green cords, their horses wore iron armour with dark green tassels, and they were distinguished by lion banners. Other battalions were also distinguished by their own colors, patterns, and flags, but neither the bright-brilliant armour or iron armour are mentioned. By the Tang dynasty it was possible for armour to provide immense personal protection. 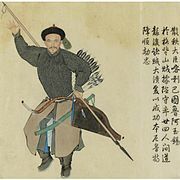 In one instance Li Shimin's cousin, Li Daoxuan, was able to cut his way through the entire enemy mass of Xia soldiers and then cut his way back again, repeating the operation several times before the battle was won, at which point he had so many arrows sticking out of his armour that he looked like a "porcupine." The effective range of a composite bow against armoured troops in this era was considered to be around 75 to 100 yards. Infantry armour became more common in the Tang era and roughly 60 percent of active soldiers were equipped with armour of some kind. Armour could be manufactured natively or captured as a result of war. For instance 10,000 suits of iron armour were captured during the Goguryeo–Tang War. Armour and mounts, including pack animals, were supplied by the state through state funds, and thus considered state property. Private ownership of military equipment such as horse armour, long lances, and crossbows was prohibited. Possession was taken as intent of rebellion or treason. The army staff kept track of armour and weapons with detailed records of items issued. If a deficiency was discovered, the corresponding soldier was ordered to pay restitution. The state also provided clothing and rations for border garrisons and expeditionary armies. Soldiers not on active duty were expected to pay for themselves, although "professional" soldiers were given tax exemptions. Li Shimin's elite cavalry forces were known to have worn distinctive black "iron clad" armour, but heavy cavalry declined as Turkic influence became more prevalent and light cavalry became the dominant mode of mounted warfare. Tang expeditionary forces to Central Asia preferred a mixture of light and heavy Chinese horse archers. After the An Lushan rebellion of the mid 9th century and losing the northwestern pastures to the Tibetans, Chinese cavalry almost disappeared altogether as a relevant military force. Many southern horses were considered too small or frail to carry an armoured soldier. Tang iron lamellae were between 9.6 to 9 cm long, 2.6 to 1.3 cm wide, and 0.28 to 0.22 cm thick. References to mountain pattern armour (Chinese: 山文铠; pinyin: shānwénkǎi) appear as early as the Tang dynasty in the Six Statutels of the Tang Dynasty, but historical texts provide no explanation or diagram of how it actually worked. There are also no surviving examples of it. Everything that is known about mountain pattern armour comes from paintings and statues, typically of the Song and Ming periods. It is not unique to China and has been found in depictions in Korea, Vietnam, Japan, and even Thailand, however non-religious depictions are limited to only China, Korea, and Vietnam. Reconstruction projects of this type of armour have largely failed to produce good results. The current theory is that this type of armour is made from a multitude of small pieces of iron or steel shaped like the Chinese character for the word "mountain" (山). The pieces are interlocked and riveted to a cloth or leather backing. It covers the torso, shoulders and thighs while remaining comfortable and flexible enough to allow movement. Also during this time, senior Chinese officers used mirror armour (Chinese: 护心镜; pinyin: hùxīnjìng) to protect important body parts, while cloth, leather, lamellar, and/or Mountain pattern armor were used for other body parts. This overall design was called "shining armor" (Chinese: 明光甲; pinyin: míngguāngjiǎ). There is an alternative theory that mountain pattern armour is simply a result of very stylistic depictions of mail armour, but known depictions of mail armour in Chinese art do not match with mountain pattern armour either. Tang soldier wearing a combination of mail, cord and plaque, and mountain pattern armour. Ming depiction of mail armour - it looks like scale, but this was a common artistic convention. The text says "steel wire connecting ring armour." During the wars between the Later Zhou and Southern Tang, civilians on the Tang side formed "White Armor Armies", named after the white paper armour they wore. These Tang civilian armies experienced some success in driving off small contingents of Zhou forces but avoided confrontation with the larger army. 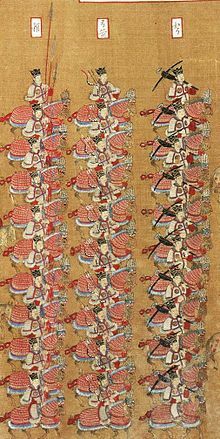 The White Armour militia army was later revived to fight against the Song dynasty, but they were ineffective and disbanded. Later Ming texts provide descriptions of paper armour. One version was made of silk paper and functioned as a gambeson, worn under other armour or by itself. Silk paper could also be used for arm guards. Another version used thicker, more flexible paper, hammered soft, and fastened with studs. It's said that this type of paper armour performed better when soaked with water. Paper armour was still worn by the Hui people in Yunnan in the late 19th century. Bark paper armour in layers of thirty to sixty sheets in addition to silk and cotton was considered to be fairly good protection against musket balls and bayonets, which got stuck in the layers of paper, but not breech loading rifles at close quarters. The Khitans of the Liao dynasty employed heavy armoured cavalry as the core of their army. In battle they arrayed light cavalry in the front and two layers of armoured cavalry in the back. Even foragers were armoured. Units of Khitan heavy cavalry were organized in groups of 500 to 700 men. Unlike some other empires originating from nomadic tribes, the Khitans preferred to fight in dense heavy cavalry formations rather than the wide formations of horse archers. During the Song dynasty (960–1279) it became fashionable to create warts on pieces of armour to imitate cold forged steel, a product typically produced by non-Han people in modern Qinghai. Warts created from cold work were actually spots of higher carbon in the original steel, thus aesthetic warts on non-cold forged steel served no purpose. According to Shen Kuo, armour constructed of cold forged steel was impenetrable to arrows shot at a distance of 50 paces. Even if the arrow happened to hit a drill hole, the arrowhead was the one which was ruined. However crossbows were still prized for their ability to penetrate heavy armour. The History of Song notes that Song "tools of war were exceedingly effective, never before seen in recent times," and "their weapons and armor were very good", but "their troops weren't always effective." Song dynasty soldiers wearing lamellar and mountain pattern armour. The Western Xia made modest use of heavy cavalry, of which it had 3,000 at its height. The Jurchens had a reputation for making high quality armour and weapons. Both metal and quilted armour were worn by Jurchens. The Jurchen army was organized into units of a thousand and a hundred. Every hundred was composed of two fifty men social and economic units called punian. Each punian was supposed to have 20 men equipped with armour and lances or halberds. These 20 men formed a standard two rank five deep battle formation while the others formed three ranks of archers. In 1232 the Jurchens used cast iron bombs against the Mongols at the siege of Kaifeng. The History of Jin states that the fire created by the blast could penetrate even iron armour. According to Meng Hong, the reason for the Mongols' success was that they possessed more iron than previous steppe peoples. Both Chinese and European sources concur that Mongols wore substantial armour capable of stopping arrows. A Song source notes that one way to pierce heavily clad Mongol warriors was to use small arrows capable of entering the eye slits of their helmet. According to Thomas the Archdeacon, Mongol arrows were capable of penetrating all known types of armour at the time, but their own leather armour could withstand the arrows of their enemies. However he also mentions that the Mongols feared crossbows. The upper part of their helmet is of iron or steel, while that part guarding the neck and throat is of leather. Whereas the majority wear leather armour, some have their harness completely wrought from iron, which is made in the following manner. They beat out in large numbers thin iron plates a finger broad and a full hand long. In each they bore eight small holes, through which they pull three straight leather thongs. Thereupon they arrange these plates one above another, as it were, ascending by degrees, and tie the plates to the thongs mentioned by means of other small and tender thongs drawn through the holes. And in the upper part they fasten a single, small thong, doubled on each side, and sewn on to another, that the plates may be well and tightly knit together. Thus a uniform protection is effected by these plates, and such like armour is made for their horses as well as for their men. It is so highly polished that a man may mirror his face in it. 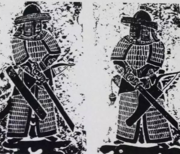 Ming guards wearing scale/mail, lamellar, and mountain pattern armour. During the Ming dynasty, most soldiers did not wear armour, which was reserved for officers and a small portion of the several hundred thousand strong army. Horse armour was only used for a small portion of cavalry, which was itself a minute portion of the Ming army. Although armour never lost all meaning during the Ming dynasty, it became less and less important as the power of firearms became apparent. It was already acknowledged by the early Ming artillery officer Jiao Yu that guns "were found to behave like flying dragons, able to penetrate layers of armor." Fully armoured soldiers could and were killed by guns. The Ming Marshall Cai was one such victim. An account from the enemy side states, "Our troops used fire tubes to shoot and fell him, and the great army quickly lifted him and carried him back to his fortifications." It's possible that Chinese armour had some success in blocking musket balls later on during the Ming dynasty. According to the Japanese, during the Battle of Jiksan, the Chinese wore armour and used shields that were at least partially bulletproof. Frederick Coyett later described Ming lamellar armour as providing complete protection from "small arms", although this is sometimes mistranslated as "rifle bullets". English literature in the early 19th century also mentions Chinese rattan shields that were "almost musket proof", however another English source in the late 19th century states that they did nothing to protect their users during an advance on a Muslim stronghold, in which they were all invariably shot to death. Some were armed with bows and arrows hanging down their backs ; others had nothing save a shield on the left arm and a good sword in the right hand ; while many wielded with both hands a formidable battle-sword fixed to a stick half the length of a man. Everyone was protected over the upper part of the body with a coat of iron scales, fitting below one another like the slates of a roof; the arms and legs being left bare. This afforded complete protection from rifle bullets (mistranslation-should read "small arms") and yet left ample freedom to move, as those coats only reached down to the knees and were very flexible at all the joints. The archers formed Koxinga's best troops, and much depended on them, for even at a distance they contrived to handle their weapons with so great skill that they very nearly eclipsed the riflemen. The shield bearers were used instead of cavalry. Every tenth man of them is a leader, who takes charge of, and presses his men on, to force themselves into the ranks of the enemy. With bent heads and their bodies hidden behind the shields, they try to break through the opposing ranks with such fury and dauntless courage as if each one had still a spare body left at home. They continually press onwards, notwithstanding many are shot down ; not stopping to consider, but ever rushing forward like mad dogs, not even looking round to see whether they are followed by their comrades or not. Those with the sword-sticks—called soapknives by the Hollanders—render the same service as our lancers in preventing all breaking through of the enemy, and in this way establishing perfect order in the ranks ; but when the enemy has been thrown into disorder, the Sword-bearers follow this up with fearful massacre amongst the fugitives. Rocket handlers often wore heavy armour for extra protection so that they could fire at close range. Brigandine armour was introduced during the Ming era and consisted of riveted plates covered with fabric. Partial plate armour in the form of a cuirass sewn together with fabric is mentioned in the Wubei Yaolue, 1638. It's not known how common plate armour was during the Ming dynasty, and no other source mentions it. In the 17th century the Qing army was equipped with both lamellar and brigandine armour. During the 18th century, the Qianlong Emperor said, "Our old Manchu customs respect righteousness and revere justice. Young and old, none are ashamed to fight for them. But after enjoying such a long period of peace, inevitably, people want to avoid putting on armor and joining the ranks of war." By the 19th century most Qing armour were purely for show. They kept the outer studs of brigandine armour for aesthetic purposes but omitted the protective iron plates. According to one English source in the late 19th century, only the emperor's immediate body guard wore armour of any kind, and these guards were all nobles of the imperial family. A Manchu officer in brigandine armour. Song axeman depicted with mail and lamellar armour. ^ Dien 1981, p. 6. ^ Peers 2006, p. 20. ^ Peers 2006, p. 24. ^ Wagner 2008, p. 85. ^ a b c d Peers 2006, p. 39. ^ Dien 1981, p. 7. ^ Wagner 2008, p. 116. ^ Wagner 2008, p. 117. ^ Wager 2008, p. 117. ^ Robinson 2004, p. 10. ^ Han 2003, p. 101. ^ Lewis 2007, p. 38. ^ Peers 2013, p. 60. ^ Twitchett 2008, p. 50. ^ Peers 2006, p. 41. ^ Dien 1981, p. 8. ^ Portal 2007, p. 170, 181. ^ Portal 2007, p. 145, 170. ^ Portal 2007, p. 183. ^ Dien 1981, p. 13. ^ Peers 2006, p. 75. ^ Wagner 2008, p. 225. ^ Crespigny 2017, p. 159. ^ a b Graff 2002, p. 42. ^ Peers 2006, p. 83. ^ Peers 2006, p. 146. ^ de Crespigny 2010, p. 142. ^ Wagner 2008, p. 322. ^ Dien 1981, p. 16. ^ Dien 1981, p. 17. ^ Peers 2006, p. 91. ^ a b Dien 1981, p. 21. ^ a b Peers 2006, p. 94. ^ Peers 2006, p. 99. ^ Wagner 2008, p. 256. ^ Peers 2006, p. 115. ^ Graff 2002, p. 147. ^ Graff 2002, p. 158. ^ Graff 2002, p. 173. ^ Graff 2016, p. 51. ^ Graff 2002, p. 197. ^ Graff 2016, p. 41. ^ Graff 2016, p. 106. ^ Graff 2016, p. 39. ^ Graff 2002, p. 176. ^ Peers 2006, p. 116. ^ Graff 2016, p. 161. ^ Graff 2016, p. 53. ^ a b Robinson 2013. ^ Lorge 2015, p. 84. ^ Kurz 2011, p. 106. ^ a b c Mesny 1896, p. 334. ^ Peers 2006, p. 132. ^ Whiting 2002, p. 305. ^ Wagner 2008, p. 322-323. ^ Wright 2005, p. 59. ^ a b c Andrade 2016, p. 22. ^ a b Peers 2006, p. 135. ^ Peers 2006, p. 137. ^ Peers 2006, p. 143. ^ Peers 2013, p. 149. ^ Andrade 2016, p. 48. ^ Jackson 2005, p. 71. ^ Peers 2006, p. 208. ^ a b Peers 2006, p. 185. ^ Andrade 2016, p. 57. ^ Andrade 2016, p. 67. ^ Swope 2009, p. 248. ^ a b Coyet 1975, p. 51. ^ Wood 1830, p. 159. ^ Peers 2006, p. 184. ^ ""Plate" armour of the Ming Dynasty". Retrieved 7 July 2018. ^ Peers 2006, p. 216. ^ Perdue 2005, p. 274. ^ Peers 2006, p. 232. Video Evolution of Chinese Armor by Dynasty.